← Takar, Kangun, Dry White Wine, Republic of Armenia, 2012, 12.5% abv. This Bordeaux Supérieur is a deep garnet with some bricking near the rim and aromas of blueberry and ripe plum with vanilla and baking spice. The palate is dry with well-integrated alcohol and the tannins are strained and become softer with decanting. The body is a little light in the middle and flavours include more blueberry and plum with cassis and some cinnamon, vanilla and clove. It’s admittedly a little lean and not as plush as most Merlot-based Bordeaux are (this blend is 70 Merlot/30 Cabernet Sauvignon) and the finish is light too. However, the flavours and aromas are well-balanced. Just a note if you are unsure as to what Bordeaux Supérieur signifies, all it means is that the grapes are harvested at a higher maximum yield and the wine is made at a higher minimum alcohol level than regular Bordeaux AC. It must also be aged at least 9 months. So, Supérieur does not mean ‘better’. It just means higher alcohol and a little more time in the barrel. 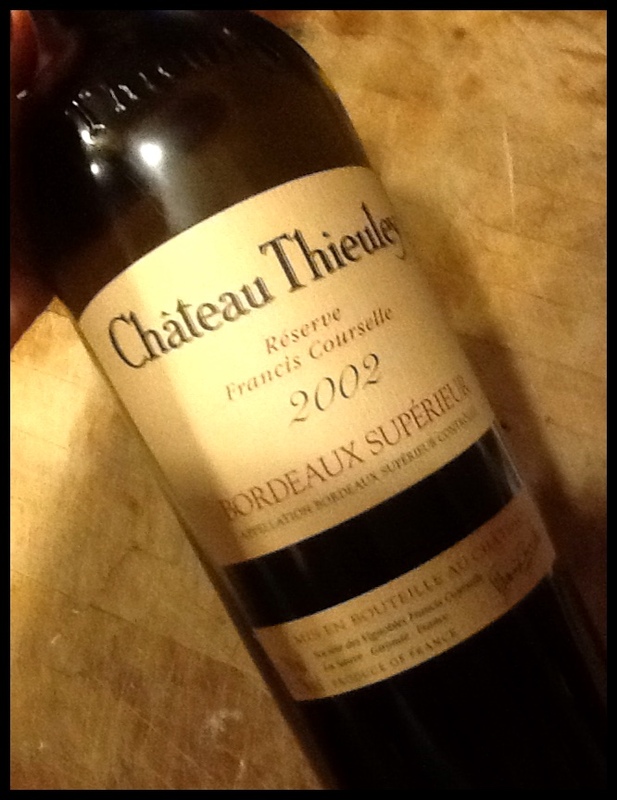 This entry was posted in Cabernet Sauvignon / Blends, France, Merlot, OTHER, RED and tagged 2002, Bordeaux, Bordeaux Supérieur AC, Chateau Thieuley, france, red wine, Reserve Francis Courselle. Bookmark the permalink.